Russia is back in the Eurovision Song Contest. Last year the entry has been withdrawn and Julia Samoylova was not able to participate with “Flame Is Burning” in Kiev. That was a bitter drama for the woman in the wheelchair. The Russian broadcaster Channel 1 has promised her to have another chance in 2018. And there she is: Julia Samoylova has a new song called “I Won’t Break” with which she is going to represent Russia in Lisbon, her big dream comes true now. Julija Olegowna Samoilowa was born in Uchta (north east from Moscow) in 1989. Since her childhood she is bound to a wheelchair due to medical accident during a vaccination. Julia took singing lesson since the age of twelve. Later on she participated in the Russian X Factor show (Factor A). Her biggest appearance was to sing at the opening ceremony at the Paralympics 2014 in Sotchi with “Together” . In 2017 she was selected to represent Russia at the ESC in Kiev. Unfortunately, she was banned from entering Ukraine for three years for violating Ukrainian law while entering Crimea in 2015, a region that was annexed by Russia in 2014. This led to a withdrawal by the Russian broadcaster, as the Ukraine was strict and didn’t let her enter the country to perform. The EBU has intervened, but without success. Normally the ESC should be a music event without any political issues. But sometimes it cannot be prevented if two countries have their difficulties. If this will be enough to convince the juries and televoters? This is the weakest Russian entry for years and the competition is strong. It could be the first time that Russia won’t qualify for the Grand Final. Russia’s debut year has been in 1994 in Dublin with “Vechni Stranik” by Youddiph, she made a very good 9th place in Dublin. At that time Russian pop music was not very well known in Western Europe. In the same year the ESC has opened its doors to six new countries, which were Lithuania, Slovakia, Romania, Poland, Hungary and Estonia. This was due to a very high interest in participation. 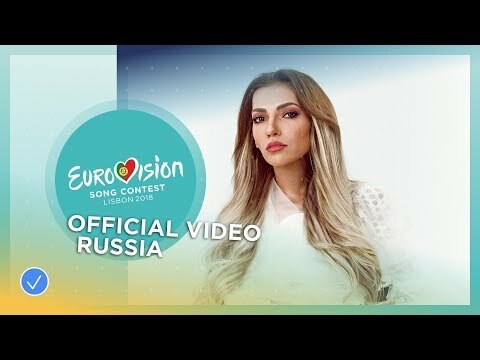 It’s no surprise that the majority of the Russian entries were sung in English, only the three first entries have been sung in the native Russian language. This increases the chances of good placings. Furthermore the aim of the Russians is to spread out the image of the utmost contemporary music to the world – the new music from Russia. A similar effect could be monitored at the 2014 Olympic Games in Sotchi during the opening ceremony. The newest beats and techniques have been used to show that Russia is ultra modern. One year later the Eurovision Song Contest took place in Moscow for the first time in history. The Russians have put every effort into these three live shows to make it the most modern ESC ever. The latest technology has been used, in particular the massive usage of LED lights ever in ESC history. But the Russians have often been close to victory four times 2nd place, and two times 3rd place. With such a good statistics nobody can complain. 12 times Russia made it into the Top10, so there is a chance of 57% for Russia to be on a top position. There is always a lot of neighbour country voting from the ex-Soviet countries, so Russia always qualified for the Grand Finals so far. Russia is the biggest country in the world and therefore it has a huge amount of viewers, the interest in the ESC has grown from year to year, there were also singers from the Asian part in Vladivostok: Mumiy Troll with “Lady Alpine Blue” (12th). Interesting to see is that there are ten time zones in Russia. Watching the ESC in Eastern Russia means people have get up at 7 o’clock in the morning to witness the live show, similar to Australia. Last year Russia has withdrawn from the contest due to fact that the singer Julia Samoylova has been performing in Crimea. This an offence to the Ukrainian law for Russians and the entry to Ukraine can be refused. Unfortunately, no exception could be made for the Russian ESC representative. The last Russian entry in Stockholm “You Are The Only One” by Sergey Lazarev made a fabulous 3rd place in Stockholm.